Feeder wires added before spiking and gluing into place. I've said it before, and I'll say it again. The Fast Tracks system is brilliant! Thanks Tim Warris. It was so much fun and easy that last night, after getting the first one in, I got three more added in the yard ladder. The only grumble moment in all this is the spikes. The Micro Engineering spikes have over-length heads, which require clipping to work properly with the system. It's a good "in front of the TV project", but it wear's thin quickly. And the other bit of completion is the Kettle Creek trestle. With the walkway and railing in, brakemen can now safely work the trains on the west end yard lead. There's much scenery to be added here before the trestle is finally secured in place. It'll be awhile, a few other things to do yet. And as always, I had fun! While the actual attendance was down from years past, 250 total, I have few issues with last weeks RPM. I got to see my friends from across North America. That alone makes the trip worth it for me. Joe D'Elia has chosen to not continue hosting the show, but rather hand those duties over to Mike Skibbe of the Modutrak group. I've already spoken to Mike about options for next year and we have plans for some stuff already. Sorry no preview yet. I firmly believe that RPMs are contributor driven. If you're finding the quality of the presentations aren't up to your personal standards, step forward on do a clinic yourself. Or encourage someone you know to do one. We all have something to share, and all have stuff we can learn. Standing on the sidelines and kvetching accomplishes nothing. Speaking of friends and sharing, here's a couple of my friends operating on Bill Darnaby's layout last Wednesday. And Jerry Hamsmith here has ventured forth from the operators position to sort out some minor disaster on the line. Just the day of operating with these guys made the 7 hour drive well worth it. I'm constantly intrigued as to how this hobby relies so much on camaraderie amongst people who spend so much time alone in their respective basements. Actually it's Lisle, but who's counting? Tomorrow morning it's into the van and a drive across Michigan to the suburbs of Chicago. For the 22nd Naperville Prototype Modelers Meet. This annual event is a high light for me. I get to see and chat with friends that I've made over the years attending this fine event. I'll be operating on 2 fantastic layouts as well. Bill Darnaby's Maumee Route and Robert Hanmer's GN/DMIR/SOO layout. I've operated on Bill's layout before and it's always a treat. A tad stressful but well worth it. There's a lot going on and I still consider myself a novice with TT&TO operations. I live in fear of making a mistake there. Robert's layout will be a whole new experience for me. I have no idea what to expect. And of course there's the clinics and the bar. And I'll have enough for the St Thomas yard. That's a pile of 12 you see. All built in Fast Tracks fixtures. I need to add electrical wires to the frogs and the stock rails and then spray paint the pc board ties and then I can actually lay these bad boys in place. Had a bit of an object lesson when I started these the other day. It was taking me about 45 minutes to build a turnout. Far longer than I remember it taking a few years ago. And I felt that I was working too hard filing the rails for the frogs, points and notching the stock rails. So I wandered over the hardware store and bought a brand new 10" mill file.Turnouts now take 20-25 minutes a piece. Terrifying what a sharp file can do. I do so little work in metal that I forget what a sharp file can feel like when it's being used. Won't forget that detail very quickly. I spent a few hours today assembling the other 2 required diamonds. Here's the trio sitting where they will live. I have to paint them first, as well as add in all the regular ties required before gluing these guys down. While fiddly, they weren't that hard to build. Just lots of little pieces of rail to create the guard rails and the inner bits of load bearing rails. The rails laid across the 75 degree diamonds are there to hold everything together until all is secured in place. Wiring these would be a challenge but Hex frog Juicers can be used to help control polarity through the various frogs. Not that I need to do that. The L&PS run may not get wired. Depends how brave I'm feeling. The first of 3 diamonds that need to be built for the layout. It is doubtful that I would have had the chutzpah to take these on without the benefit of the Fast Tracks assembly jigs. They really make short work of the otherwise very tricky trackwork. I've also spent far too much time in front of the monitor today. I finally pulled together the 2 PowerPoint presentations I need for Naperville. Yes, that RPM is a little over a week away. I'll be talking about Prototype Modeling from a Canadian perspective for the "Friends of the Freight Car" dinner and I have a clinic in reserve should a presenter have to bail at the last minute. I really enjoy the RPM meets. I get to meet up with friends and like minded modelers from all over. We share stories, ideas, prototype history, etc. The meets, I firmly believe, are contributor driven. Without clinicians to share, these events are nothing. Consider presenting yourself one day soon. You may have that nugget of info that someone was looking for. Got some ballast down today. The last layout and my old Free-Mo modules used Woodland Scenics products. I wasn't completely thrilled with the way the Woodland Scenics ballast behaved. When I applied the glue, I would wind up with an inordinate amount of "floaters". Which would have to be scrapped off once the glue had set, prior to laying rail. Turns out that the Woodland Scenics ballasts are made from crushed walnut shells, which would explain the floaters. This time I turned to Scenic Express and used their line of crushed stone ballasts. The mainline is ballasted with their fine light gray while the spurs are being done with their light cinders blend. The dust in the cinders has darkened the ties considerably, and I'll have to find a way to address that. But generally I'm very pleased with the results. I only do a preliminary ballasting so has to prep for laying the rail. Once scenery is in, I'll come back and clean up the edges and such. I don't ballast turnouts before laying the track, since I've had nothing but trouble in the past gluing points shut. It's starting to look like a railroad! 3,500 ties so far. Glued down, sanded and stained. Think I have to buy more ties soon. Ballasting has started, and once that is done out comes the rail. The bridge is now sitting as it should. The rails rest on the ties and on the bridge bearings. I had to toss the cast metal bearings from Micro Engineering and cobble up my own, but once they're painted black, they'll mostly disappear. It took about an hour to trim the footings for the piers and reglue them back into place. My thanks to all who offered up suggestions to resolve this issue, with one notable exception. Chris is clearly still suffering after affects from the caulk in the eye incident in the Train Masters TV studio earlier this year. With things back on "track", the actual rail and ties were glued down and the first acid test performed. The bridge seems to support Tilley. That's good news. All this strip wood will become the walkway that ran the full length on the north side of the bridge. There is nothing I hate more than having to redo something. Particularly when it's my own damn fault. Late yesterday I realized that the whole bridge assembly was sitting too high as compared to the ties leading to it. By 0.040"! Where the error actually occurred is a bit of a mystery to me, but it doesn't matter. The bridge needs to be lowered. The bridge bearing castings from Micro Engineering will be replaced with scratch built items that will be 0.170" high and then the cast footings will have to sanded to fit and reinstalled. And I had thought I was being super careful watching the heights and making allowances for the various bits and pieces. Hey look! It fits in the space created for it! As you can see, the truss span is painted. It does have rivets applied, but that'll get covered at a later date. I recycled the abutments and the pier footings from the old layout. Spent a little time fiddling the footings into place, shimming, filing as required. The actual deck is being painted and then it will get glued in place. The whole bridge will not be secured in place for some time to come. I have much scenery work to do before that can happen. Little bitty bits of wood. So my wife calls them. She really hasn't seen the scale 1x2 in the shop yet. But we're laying ties! It's looking a lot like a railroad suddenly. All the switch ties are now in place and I can start filling in the mainline and the spurs with ties. I'm using the Tie Racks from Fast Tracks to assist in the laying out of the ties. I'll be using a different tie centre spacing for the main as compared to the siding tracks. It should make for a nice detail. Once all the ties are glued down , I'll sand them and stain then add ballast before starting to lay track. However the very first bit of track to be built will be the 3 diamonds along the L&PS right of way. Took a lovely drive down Highway #3 Monday afternoon. My latest order from Fast Tracks was ready for pickup. So off to Port Dover I went. Turnout tie strips in abundance. Printed circuit board ties, wood ties and "Tie Rack Tie jigs". And the 90 degree diamond fixture. I now have all the bits required to lay track in the St Thomas yard. First I have to make more progress on the Kettle Creek bridge before I'm ready to really start swinging the hammer in the yard. 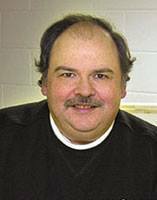 With a heavy heart, I’m sad to report that Andy Sperandeo, who has been a part of our lives at Model Railroader magazine for more than 30 years, has died. As some of you know, Andy had been fighting cancer and other ailments, and the combination finally caught up with him earlier today. Andy started work at Model Railroader in 1979, becoming editor in 1993. In time he became executive editor and upon retirement a few years ago became a contributing editor. Readers today are most familiar with Andy through his monthly The Operators column. He has also edited our Great Model Railroads annual since its inception. Information on services or memorials remains pending at this time. I consider my self privileged to have been able to call Andy a friend. We always chatted at Naperville and I was looking forward to seeing him again in a few weeks. Like everybody who has an online presence, I too am subjected to odd phishing attempts and being contacted by long lost relatives who also happen to be Nubian Royalty down on their luck. Having a couple of websites for my businesses only aggravates this activity. From time to time I get suggestions for how to improve my website visibility or offers from Chinese factories to produce product for me. Today, I got an email through my contact page that was a genuine "milk through the nose" moment. My name is Nicholas Ivary and I was hoping you would be interested in increasing your assortment on Walmart.com. I am familiar with your product line and think you would be a great addition to Walmart.com, especially right before the holiday season. I leave it to you to decide which of my product line he thinks would do well in Walmart.